I enjoy reading race reports. And, in most race reports where the runner runs in a race with the word 'Endurance', 'Challenge' or both 'Endurance Challenge' you get to read along as the runner suffers all that makes up the endurance challenge and the usual conclusion that if you are going to attempt it you better be prepared. The North Face Endurance Challenge is no exception to this classification of race and this years race on Dec 6th, 2014 enjoyed a deluge of rain the night before promising to make the challenging course even more so. Here are my results with muddy details to follow. One of my favorite race reports was from Ginger Runner (#trainracebeer) after he attempted his first NFEC 50k back in 2012 and many of his observations and tips came true for us in 2014! The 50 milers started out first 2 hours before us 50kers and were broken into waves (1-4). By the time I started 50k/wave 4 the trail was turned up mud and later just like GingerRunner noted as a slower runner you get to encounter the elite 50 milers coming back at you on the out-and-backs in a very physical way (more on that later). One advantage of being in wave 4 was that I was very relaxed and got to take pics before wave 1 went out at 7AM. Below are two super runners, Sunny to the left, who eventually finished 1st in her Age Group and 7th overall female (5:10); and Veronica on the right who finished 100 miler Rio Del Largo (RDL) in 26:17 hours Nov 7th and was running NFEC 50k as a recovery run (6:35). 50k, wave 1 start with Dean Karnazes motivating everyone on! 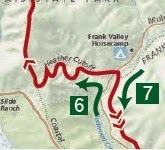 Start out to Bobcat Loop (modified route due to rain and closure of Muir Woods trail). 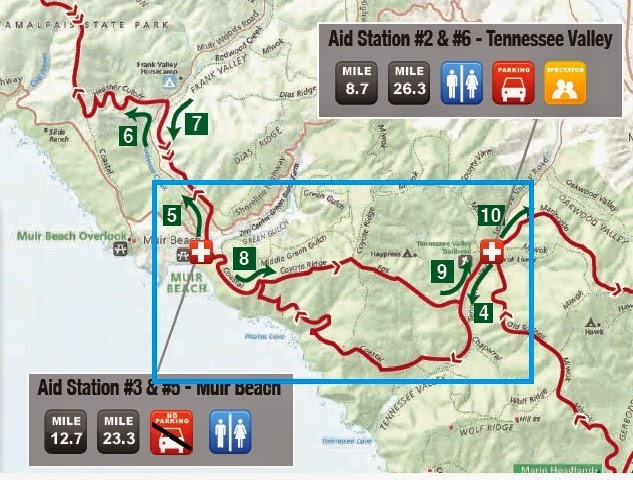 The park service has a rule that if an inch or more of rain is received then they will close the Muir Woods single-track trail - and that is exactly what happened Friday night before the race. As a result, both 50k/50m courses were modified to do an initial 5 mile loop that I will call the Bobcat loop (see diagram below). The first half of the 5 mile loop from Bobcat is a gentle incline that smart runners either power walked or conserved energy the best they could lest you burn up before you even start. Runners that were not so smart (remember we're wave 4) decided to drop as many people as they could on this 2.5 incline and I'm willing to bet paid for it dearly later. I power walked. One of the toughest stretches of the course was coming down the slippery steps towards Muir Beach (Pirates Cove?) then up rolling mud trench back up towards Heather Cutoff. The 'trench' was deep mud that caked on your shoes, with no shoulder to slip by on and was a suffer fest. I don't have any pictures of the 'trench' because I was 100% focused on not falling into the mud. Too bad. Would have been great photos. You want to put the fear of God into a trail runner just mention Heather Cutoff. 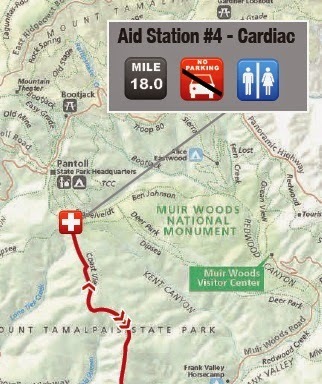 Yes, a tiny little 1 mile section of switchback that folks are and will be talking about for a long time to come. This section was a perfect storm of muddy water running down trail, elite 50m running racing down and 50k folks slowly picking their way up to make one heck of an entertaining traffic jam. 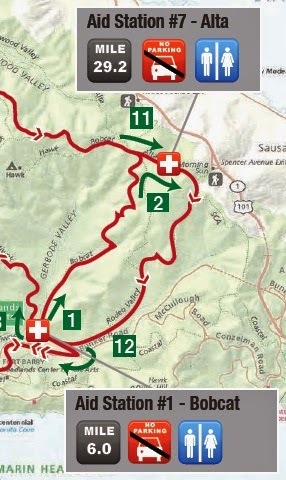 The hairpin corners were even more fun because if you were an elite and not watching your footing you went down. If you were working your way up and got in the way of someone coming down ... well in physics momentum is conserved and someone is going off in an equal but opposite direction. Maybe it was just me but in my mind I had mentally set the turn around at mile 16 because hey we were running a 50K/31miles and by 16 I better be turning around. Not. After Heather Cutoff I was really looking forward to some rolling hills to work off all the mud and to recover. Not so. There were several climbs but eventually we all made it to the Cardiac AS. Was a great AS with porta-potties, lots of Volunteers refilling hydrapacks, lots of food - even a fountain to wash you face off in. I spent a good 10 minutes just recovering and chit-chating with people. But, then you saw that look like 'hey I wonder how close to the cut off I am or how far behind on my plan am I?' and you packed up, turned around and headed back down. Yes, down back to Heather Cut off to do the muddy switchbacks in reverse! Ugh! Just before the switchbacks is a short section (I don't know the name) but it is dry single track amougst moss, ferns, some dense forest that is just drop-dead beautiful. I really enjoyed this section and could have just sat down and enjoyed the smell and sounds of the forest. Then, as you got closer, the mud started again and didn't stop. On the way back down the mountain on the Marin side you are treated to some nice views of the bay. The Finish - By about mile 30 I was done. I don't mean I was sick or bored but bone dead tired and was ready for the finish and my beer. Before - shinny new Hoka Stinsons! Priorities. After I received my finishers medal I chit chated with others from Forward Motion Race Club then headed over to the beer garden to get my beer! There were four beers to choose from that I remember but I was drawn to a seasonal IPA named Celebration. Wandered over in my wet clothes, found a chair towards the back and just sat for half hour and relaxed with a beer I so well deserved. After my escape, I went back to get my printed shirt, changed into warm clothes in the bag check area (hey it was warm) then worked my way to the bus. I didn't mention the bus ride from LarkSpur Ferry Terminal parking lot because it went off perfectly. I arrived about 5AM and it left about 5:10AM for a short 30min trip to the start. The bus ride back wasn't nearly as much fun. First we waited more then 30 min for the right bus. [There were two busses plus the normal city bus that goes downtown SF for $2] There was a long line for another bus, but our bus to Larkspur was relatively short. And, we were able to get everyone in on one bus by squizing three to a seat. It was cramped, I started to get nausuous but my seat neighbors were friendly and we chatted about the race. The ride took forever with traffic but eventually made it back to terminal parking. The ride from Larkspur back to Pleasanton also took twice as long due to traffic around Berkeley and when I got home I had a long hot shower to wash off all the mud and my wife made ginger-chicken soup for me. Man, that soup hit the spot. Conclusion: Even though I've run three 50ks and four road marathons prior to NFEC I really wasn't ready for the elevation change _and_ muddy trails. I hydrated well with Tailwind which worked very well. Ate more than 600 calories of real food bars (nut butters with fruit, etc). But, the extra work of trying to keep from falling really took a toll on my energy reserves and was just tired by mile 25. I may just have to run this course again next year after much more long distance training under less than ideal conditions.